I had been working all morning and had just sat down on the couch when my phone went off. It was a text message that said “Asiana 777 down at SFO”. 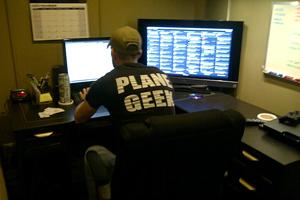 I went immediately over to my computer and got NYCAviation started on what we do best. Matt and I used to activate a “Crisis Center” of sorts in these situations. Establish a quick line of communication between the two of us, do a quick task assignment with a “you do that, I’ll do this” and off we’d go. Without my teammate Matt now, and stupid me for not having briefed Jason or other staff on this type of contingency, we still went for it. Running through a checklist of tools, resources and contacts, NYCA started delivering facts to the public. It is worth noting that none of our resources include the mainstream media as a source of information. Besides, according to timestamps, NYCA beat out every mainstream outlet on breaking the news of the crash anyway. The only thing I did monitor them for were casualty counts. For everyone we spoke to, we could not confirm anything about passengers that had become injured, perished or were unaccounted for. Though indications looked promising that all had survived, I waited until I could triple-source the information with mainstream outlets before I felt comfortable reporting that from our end. What a mistake. It came out a short time later that there were, as we now know, two people that did not survive. My insides sank. Of all the facts for us to have gotten wrong, why did it have to be the death toll? 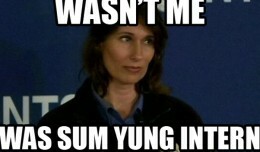 What if, in the off chance, Asiana family members had been reading NYCAviation to gather information? What if they rejoiced when they learned that everyone had survived before realizing that they once again had to fear for their loved ones? I beat myself up for that, because even though we don’t have a TV studio or print paper that you pick up with your morning coffee, people look to us for reliable reporting, and we take that responsibility seriously. Aside from the mistake, learning of the two fatalities changed the game for us. In my head I had been prepping for another Hollywood-ending where all had walked away in yet another victory for modern aviation safety. Right up there with US Airways Flight 1549 and Air France 358, we could chalk up another 307 miracle survivors on Asiana Flight 214! But all that changed when that measly number of two became the two most important reasons to do our job right. As I’ve said many times, no airline fatality dies in vain. Every crash brings about lessons, regulations and procedures that make aviation in western countries the safest mode of transport in existence. FACT: The odds of dying in a plane crash are the same as being struck by lightning 7 times. NYCAviation may not be on Asiana’s, the FAA’s or the NTSB’s Go-Team, but with those two fatalities, our own investigation gets kicked up a notch. Our overall goal is to help make aviation enjoyable and safe for all. The more that we can translate the tech-talk and inner workings of the airline industry to the general public, the better it is for everyone. But when you look over at those mainstream news outlets, one can only wonder…what are their goals? Who are they looking out for? Some misleading facts when reporting on airline crashes. Twitter was abuzz with people frustrated and angry at some of the misleading information that was coming from the popular cable news stations. One program showed a listing of facts about recent air safety, declaring that 2012 was the safest year in aviation since 1945 with a mere 23 fatal accidents and 475 deaths. To the unknowing public, that sounds pretty horrifying for a “safe” year. Those “facts” are misleading because they simply do not apply to most travelers, as those stats not only include crashes from all around the world in places with different regulation than ours, but they also contain accidents from private, business and some general aviation aircraft as well. The reality is that not only did 2012 not have any fatal airline accidents in the United States, but this country hasn’t seen an airline crash with a death since February of 2009. And the previous one before that was in August of 2006. In fact, before Asiana 214, the last ten years have only seen fatalities in those two airline flights, resulting in a total of 91 passenger deaths. With over 500 million domestic passengers annually (via feller at dhead inc), multiplied over a decade, the relevant stats sound much safer, no? So why can’t the mainstream news tell us that instead? I could continue with more that we witnessed from them the past few days, from confusing facts and wrong terms to simple errors such as saying the “NTBS” is enroute to the scene or that the Captain had flown 10,000 miles instead of hours. But in the end, the information massacre from the mainstream is what we are used to seeing in the aviation industry. Does the mainstream media do this to harm us? Is it all just fear mongering? I really don’t think so. While I do find it to be irresponsible, I don’t think it is intentional and simply comes down to a level of ignorance that I can’t really blame them for. Not being aviation experts themselves, they are just as scared as anyone else among the flying public after a crash, and are therefore just as susceptible to cling to misleading information and erroneous facts. Unfortunately, that gets passed along to you as well. The solution is obvious; get experts. Bring on people who not only can offer expert commentary (ahem), but can help in the reporting process as well to make sure that the news coverage itself is of quality and worth to the general viewership. Though the fear may sell papers, more people will respect and regularly tune in to a news organization that they know will deliver trustworthy news that educates and enriches people while doing so. That is responsible journalism, which is becoming an endangered species these days. Though I’ll see cool helicopter footage in the mainstream, I know I’m not fully apprised and briefed on the world of aviation until I’ve read through NYCAviation, AirlineReporter.com, Jon Ostrower, AirplaneGeeks.com, Airchive.com and a host of other “avgeek” expert sites and writers. At the end of the day, we are always going to report to you what we know. It will be factual, useful, and when it does not involve grim news, it will be entertaining and maybe even funny. We will be wrong at times, but we will always follow that up with accountability and responsibility in making sure that when you leave our site, you believe what we said, and it leaves you feeling both safer and happier than before you came. We want to turn your fear of flying into a passion for flying, where that drink that you have on a plane is not to calm your nerves, but instead to celebrate that you’re taking to the skies as you embark to see the world. May the victims of Asiana 214 rest in peace, and may those whose job it is to keep us safe continue the outstanding work that they do. 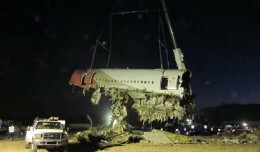 NYCAviation has obtained photos from the Asiana Boeing 777-200 crash site. 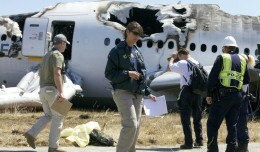 A San Francisco news station shared false prank names of Asiana 214 crewmembers that had been confirmed by the NTSB. 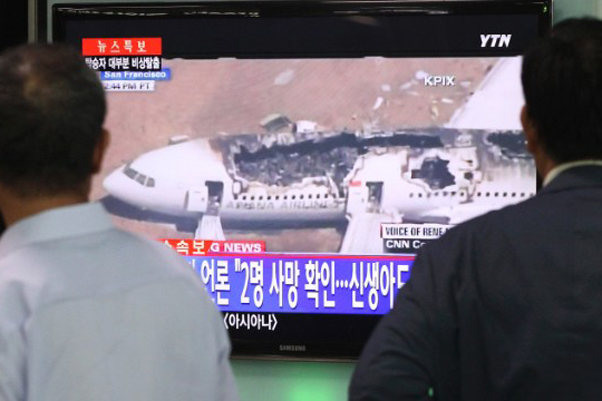 CNN lost what little respect I had for them in reporting on Asiana 214; when they did involve an expert, Patrick Smith, they blatantly cut him short when he simply wasn’t being sensationalist for them. Wolf Blitzer was bordering on arguing with a member of the Emergency Management team when he was seemingly disappointed that the figure of 60 unaccounted for had been revised to all passengers accounted for (including the 2 fatalities). It was sick. Well said Phil! Credibility among the mainstream media continues to be lost when tragic events like this occur (aviation or otherwise). There is a discussion going on right now in the Airliners.net forum – the feeling is the same among many of us. Thanks for accurately reporting the matters related to OZ 214, as we need some clarity among the field of misinformation. And don’t beat yourself up too much about your initial reporting on the fatalities. Unfortunately, mistakes do happen and I think we can all tell how genuinely apologetic you are about it. Thanks for all that you guys do and keep up the great work! Phil, you guys did a great job. The media will always take the sensationalist option, as long as the reporting is done by people with a microphone, a camera crew, the competition breathing down their neck and a tight deadline. sensationalism will win the day. I spent many years in airline PR, and later training people in crisis management, so I know what you are up against trying to report responsibly and accurately. Stop feeling bad, you did a great job – these things are never easy, and the situational knowledge changes so much in the early stages. You make some good points. First off – don’t beat yourself up over the missed survivor count. If your goal is 99.999% accuracy then you are probably in great shape. As for mainstream media’s failure to deliver news without spin or balance, we lost that long ago. And while the FCC claims on their website “As public trustees, broadcasters may not intentionally distort the news. Broadcasters are responsible for deciding what their stations present to the public, and the FCC has stated publicly that “rigging or slanting the news is a most heinous act against the public interest.” (I almost laughed coffee all over the place when I read that), obviously they have never watched Hannity or Nancy Grace. We all know todays news networks are beholden to ratings, advertisers, and politicians, and not the people they are reporting to, or about. We can only hope there will be more news outlets like yours who feel the facts have an commercial value that must be ignored. You guys are doing a great job… thank you!